In our effort to expand our cloud footprint, we’re very excited to announce the launch of our new region in Santa Clara, California at the heart of the Silicon Valley. We’re also happy to announce that the cutting-edge data center located in Silicon Valley is running the latest release of OpenStack, Rocky. By being the first cloud provider to be running Rocky, our users will benefit from the latest features and bug fixes from day 1 of the release. The launch of the new data center comes as a response to the increasing demand for OpenStack cloud services within the United States. This will allow us to continue delivering highly performant, flexible and competitively priced solutions to companies requiring their data to remain within the United States. The new Silicon Valley data center was built using the latest technologies and hardware to provide a robust and innovative solution. The new region is equipped with nested virtualization which allows users to take advantage of the latest solutions on the market such as Kata Containers, an open source project that aims to increase the security of containers using KVM virtualization – a project that is tested on VEXXHOST and is sponsored by us as well. Additionally, the Silicon Valley data center is equipped 40Gbps internal networking, one of the fastest connectivity offered. This allows virtual machines to talk to each other at lightning speeds while providing a high throughput and low latency for users. The result is a performant platform to host use-cases with large amounts of data requiring fast processing such as big data, Kubernetes, and much more. Each virtual machine launches has access to the 10Gbps public internet which allows for very fast downloads and uploads. The brand new data center is also equipped with high-performance triple-replicated and distributed SSD storage. The new data center is running on the latest release of OpenStack, Rocky. It’s important for us to be running Rocky as we strive to deliver that latest and greatest technologies to our users. We know that user get as excited as we do about new features and we love delivering it to them as quickly as we can. Running the latest release of OpenStack is part of our continued investment in open source technology. VEXXHOST has always prided itself on offering open source based solutions and keeping infrastructure free of any vendor lock-in. This new region is no exception. The new region will offer the same comprehensive list of solutions including cloud load balancers using OpenStack’s Octavia project, big data services using the Sahara project and fully conformant Kubernetes clusters using OpenStack Magnum. Both Octavia and Magnum have exciting updates in the latest release, Rocky. Octavia now supports UDP which allows cloud load balancers to be used in use cases such as IoT. Magnum, on the other hand, is now a fully conformant Certified Kubernetes installer. Give it a try, on us! 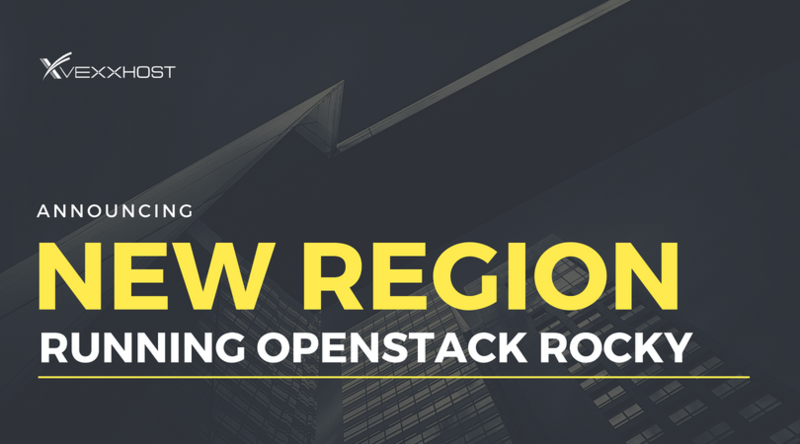 We would like to invite users to try the latest release of OpenStack offered in our newest region. You can do so by signing up to the OpenStack Passport Program to request a free trial of the service.